Midwest Roadtrip Day 5 – On the road to Michigan | Tales From The Ipe! We loaded up the car by noon, checked out of the hotel, and hit the road. Our friends Paul & Biji wanted to get a head start for Michigan, but we wanted to try to squeeze in a quick visit at the famous (should be infamous) Navy Pier. It was one of those places we didn’t want to skip, because we heard it was nice. After driving around searching fruitlessly for decent parking, we ultimately paid $17 for parking at a lot, then walking over to Navy Pier. 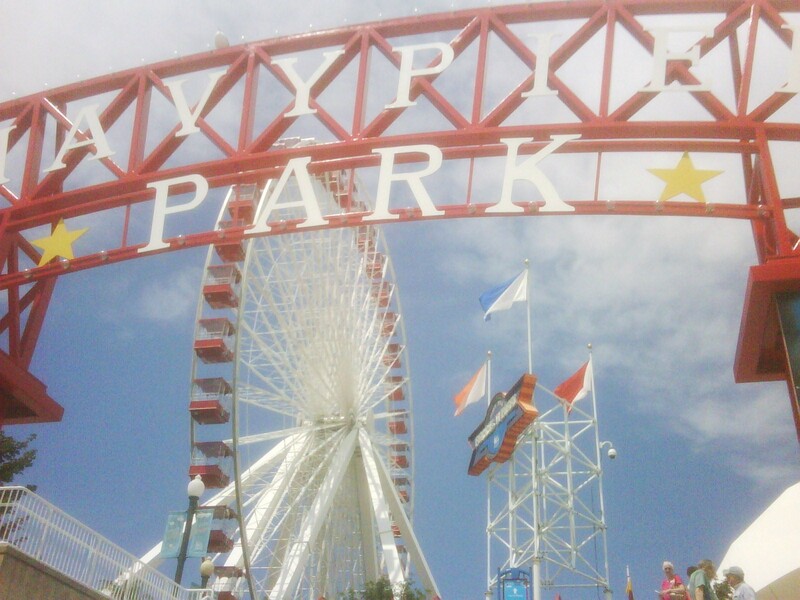 It turns out Navy Pier wasn’t as spectacular as it has been portrayed. It reminded me a lot of NYC’s South Street Seaport — one big tourist trap. There are boat rides, amusement park rides (total 3), and places with overpriced items, e.g. $7 for a lemonade. We wanted to get a boat ride in, but we missed the next time slot. We ultimately spent $24 for four tickets to go one revolution on the ferris wheel. A bit of a rip. We didn’t want to wait the additional hour for a boat ride, didn’t want to spend an obscene amount for lunch, and the rest of the rides required Joshua to be taller. So, we walked back to the car. On the road by 3pm, and we only hit some traffic around Michigan City, Indiana, around rush hour. After we hit that trouble spot on I-94, the roads cleared up, and it was smooth sailing through Indiana and southern Michigan. Not many cops and no traffic. About two years ago in 2008 when we travelled to the midwest for Thanksgiving, we encountered much traffic, and we’re still a little scarred from it. So far, we’ve been relatively lucky. What we haven’t been lucky about was remembering everything we should have packed. We didn’t have enough toys to keep the kids occupied, I forgot the stroller (so we bought a new one on Sunday @ Target), and we surprised to find that the car power cord for the kids’ DVD player was misplaced. A road trip and no Disney movies? Holy cow, we’re gonna be in trouble. Somehow, we managed to make it without movies during the ride Thursday and Friday, but the kids were bored to tears today on the way to Michigan. We had tried to find replacement power cords and/or power inverters at various Target stores, but not much luck. We ultimately decided to stop in Battle Creek, Michigan, to get gas, and find a Target or Best Buy that might have it. I found both at the Best Buy in Battle Creek , and I decided to go with the power inverter for $34. My logic? If we find the power cord at home, then I have a useless redundant power cord. 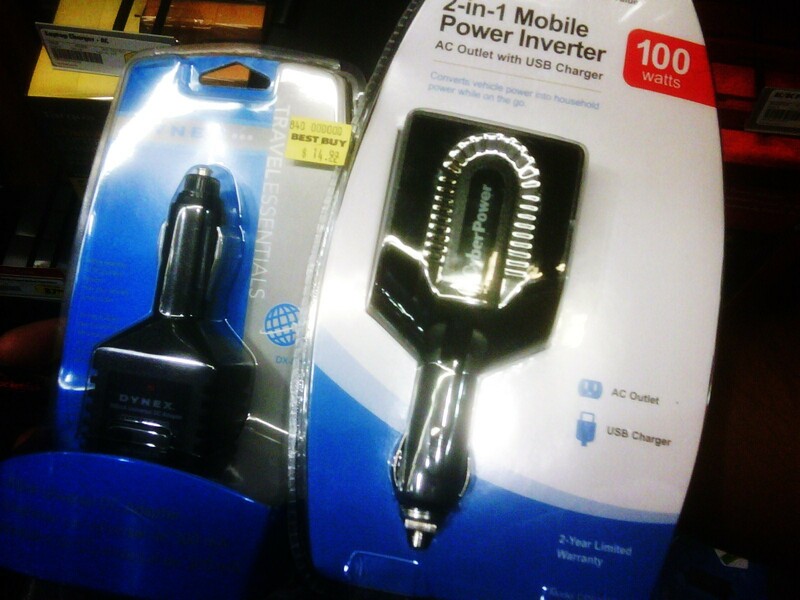 If I buy the power inverter, I can use it for a myriad of devices (like a beard trimmer?) and it has a USB port. As per the Ipe Purchasing Rule, devices with multiple uses win over single-use devices. We eventually arrived at Paul & Biji’s house at 10:30pm. It was good to finally get out of the house, and no more long-distance driving until Friday. We didn’t stop for dinner, so we had sandwiches at their house. I can’t wait to get some sleep. I’ve never been a fan of long-distance driving. My wife can do it, but I get tired/bored pretty easily. If you want to drive long distances, call my wife. If you want to get somewhere in a hurry, through traffic, and get there yesterday, I’m your guy. My wife has trucker blood in her. I have cabbie blood in me. This entry was posted in Trips and tagged best buy, power inverters, target. Bookmark the permalink.